NEC Display Solutions Ltd., as a member of the NEC Group, is responsible for the imaging and imaging-related equipment business and is a global company with a full lineup of high quality, highly reliable imaging equipment. For the projector business, the company offers a wide range of products from digital cinema projectors to compact, lightweight portable models. It is developing products that employ optimum projection methods for the required specifications, which may vary depending on the purpose of use and the installation location. For the monitor business, NEC Display Solutions Ltd. provides professional-use models for graphics, medical use, and CAD/CAM; large screen monitors for displaying information and signs; and IT monitors for use in offices. The company materializes functions required for a variety of uses with optimum technologies. NEC Display Solutions Ltd. will propose effective imaging spaces and imaging solutions to satisfy and impress the customer, using our superior technologies supporting an abundant lineup of products and know-how accumulated through our extensive experience in system construction. 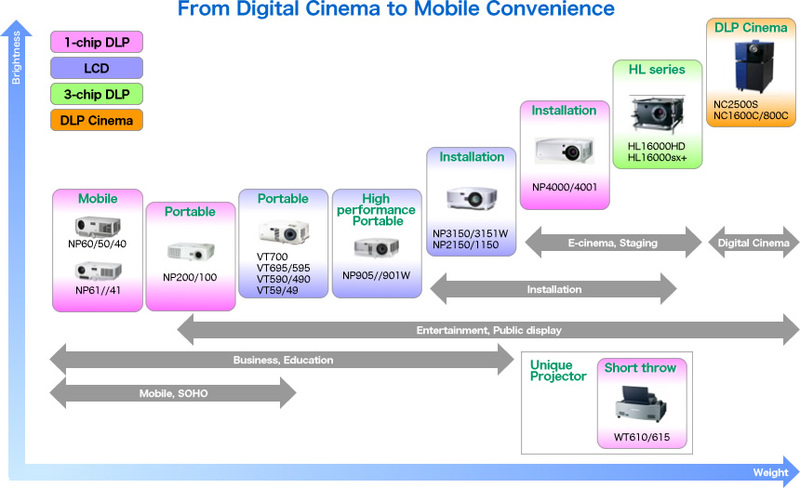 NEC Display Solutions Ltd. is one of the few global manufacturers employing three major projection methods in its projector products: LCD method, 1-Chip DLP method, and 3-Chip DLP method. The respective projection methods have advantages and disadvantages. We employ optimum projection methods in our products considering the purpose of use, the place of installation, the required functions, and the specifications in order to respond to different requirements from customers. In order to achieve high brightness, high quality images, compact body and light weight, as well as improvements in the functions of projectors, NEC Display Solutions Ltd. develops unique and advanced technologies. To shorten the throwing distance, we developed and produced a projector with the all-mirror method that does not use any throwing lens at all. We will respond to the customer requirements with highly advanced technologies. Projectors of both the LCD method and DLP method have a display device that throws light from the light source by transmitting or reflecting the light, instead of LED. Due to this nature, they have the disadvantage that the image contrast tends to be deteriorated, and the solutions for this have been an issue for improving image quality. In order to improve contrast, some optical measures, such as variable brightness of lamps according to the projected images or variable optical iris are ordinarily provided in general. As an electrical measure, variable contrast according to the projected images is also available. However, this method has the disadvantage that it is difficult to improve the contrast of entirely bright or dark images. Then, we improved the contrast perceived by the eyes even for images where the contrast is difficult to improve with ordinary methods, by employing the image processing LSI uniquely developed by us. Contrast Enhancement uses a characteristic of the human eyes where the perception of the color tone may vary with the contrast and the brightness of the surroundings. By improving the contrast perception at the eyes, shadings are more noticeable and details can be expressed clearly. (Photo) By employing a circuit configuration emphasizing the middle to high range of the frequency elements of image signals, contours and undulations of images are clearer and the contrast perceived by the eyes has been improved with the entire cubic delineation as well. For this function, the method could be applied up to the SDTV class due to difficulty in the circuit size at the beginning of development. We improved the processing method drastically by using external frame memory so that we could increase the number of horizontal dots, and then the method became possible to apply to 1080i for HDTV. For the RGB signals of PCs, the method is applied by converting the RGB signals into component signals internally. This function is now available for hi-vision images and PC signals. 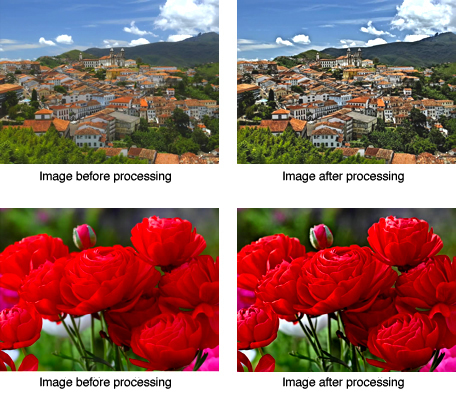 Furthermore, although image signals are processed with 8 bits in the ordinary system, we developed a method processing image signals for HDTV in 10-bit. Thereby, the projector itself can process input and output signals in 10-bit for an improvement in image quality. NEC Display Solutions Ltd. has a concept “to display the actual thing as it is” for developing monitors. Based on this concept, we develop various kinds of technology for materializing the optimum color management. Calibration, Uniformity, and Luminance are specific keywords for this concept. As a result of this development, the users in the photograph industry and the printing industry who are professionals in images use our products. Furthermore, our monitors for medical diagnostic imaging are also used by the medical industry. 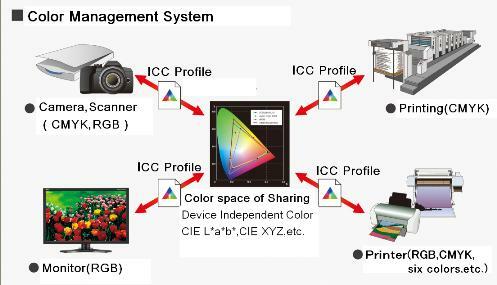 This means the operation of equipment, such as monitors and printers, for expressing the subject color precisely. Thus, the unit verifies the current color reproduction conditions and compensates the settings for reproducing the colors to be expressed more exactly. For instance, the color calibration is an operation for compensating color expressions that have been changed due to changes on standing from ones that were expected to be expressed originally by the monitor. There are two types of calibrations: the hardware calibration method where the display will calibrate colors automatically to the values set by the user previously, and the software calibration method that uses software from other manufacturers to calibrate colors manually. This means an operation for standardizing color tones on different monitors. For instance, this function is used to reproduce different color expressions on different monitors of a photographer and a designer with the same color tone for the reasons as mentioned above. Specifically, the basic color information is transmitted to both monitors by using the color information and profiles, and then the colors are compensated accordingly. This means preparation of an environment where all persons involved in the operation process share common colors. To standardize precise color expression, the respective monitors must have a function to execute precise calibration. The color calibration adjusts the white point temperature, brightness, and gamma value. This function shall basically set these three items to the values desired by the user and save on the monitor. For the High-grade series, all models are equipped with the hardware calibration function. The dedicated application software and the corresponding color sensor are required to execute the actual color calibration. Install the dedicated software on your PC to execute the basic settings, and then connect the color sensor to the USB port on your PC. Set the desired values for the color temperature, white point temperature, brightness, and gamma value, and press the calibration button to set the color sensor on the monitor screen. When the dedicated application is started, the color sensor will examine the current monitor condition carefully. Then the monitor automatically adjusts the relevant items to the conditions set by the user previously on the basis of these data. Among the high-grade series products, LCD3090WQXi is equipped with the self-calibration and the copy calibration functions. 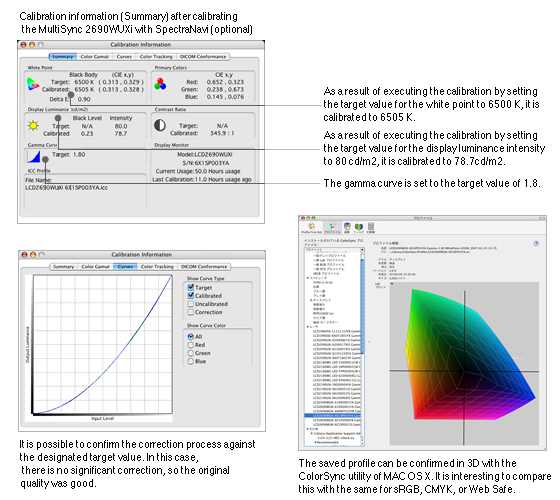 Since the calibration software is integrated into the monitor, it is possible to execute the calibration of the gamma property, white point, and brightness simply by connecting the corresponding color sensor.